A perfect album? In a word, no. A flawed masterpiece? Not even that. And yet, Rush's 3rd album has always intrigued me in a way that not many Rush albums do. It's off kilter and certainly a little uneven, but I think that Rush manages to show flashes of brilliance that reach highs they would never again venture towards. "Bastille Day" has all the makings of an instant classic (which indeed it has turned out to be); it's got a hard driving riff, great performances all around, and of course a healthy dose of historically based, intellectual lyrics delivered in the wailing tones that only Geddy Lee can deliver. It seems to me that Lee hadn't quite mastered his formidable voice yet here; there's still a bit of shrieking and über-wide vibrato that hasn't been quite polished off yet, but there's something to be said for such a raw delivery, and it certainly has its own charm. "I Think I'm Going Bald" is fun but completely forgettable, which I think is basically all that needs to be said. "Lakeside Park," too, is nice enough, but contains some of the worst cheese ever penned by everyone's favorite Canadian power trio ("although it's just a memory, some memories last forever" ?ugh) and it certainly doesn't stand out to me as one of the better tracks in Rush's catalogue. 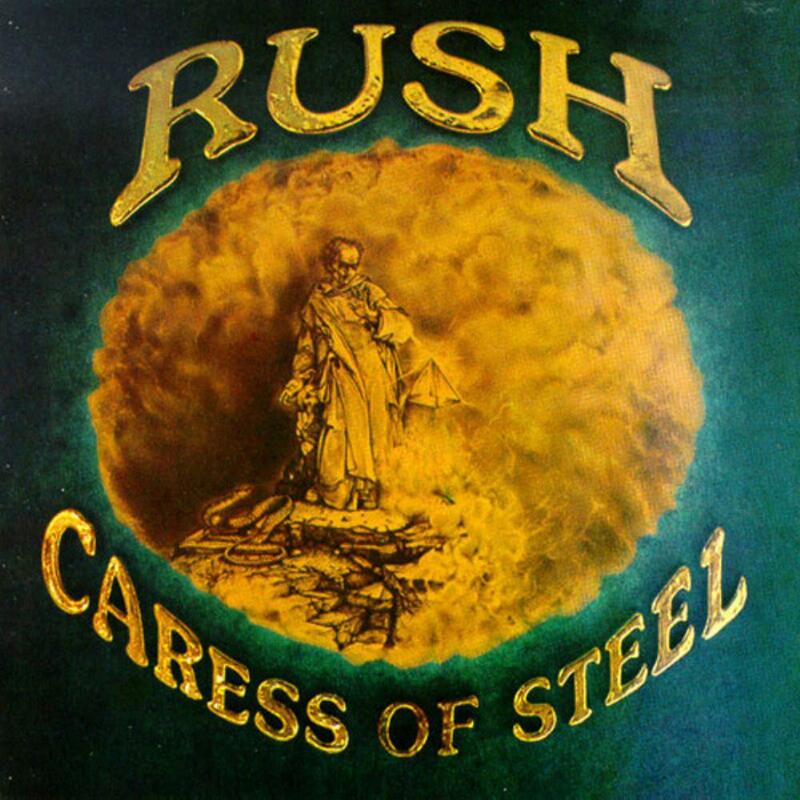 Why then, do I rate Caress of Steel so highly? Well, because I would argue that the final two tracks on the album are two of the most interesting Rush ever recorded. "The Necromancer" may be a bit disjointed as a track, but the playing throughout is superb, and the pacing overall is very nice. Alex Lifeson has an unfortunate tendency to be overlooked in the face of the two larger personalities of his bandmates, but it is clear from this track that from a musical perspective Lifeson is every bit the master that Peart or Lee is. As a matter of fact, I think that "The Necromancer" contains some of his very best playing. Lee's vocal performance here is probably the best on the album, too, and Neil Peart is, well, Neil Peart. What else can one really say? "The Fountain of Lamneth" has to be one of the more forgotten songs in Rush's catalogue, especially with the similarly long "2112" so visible as Rush's flagship epic, but man oh man, is this a good one. It's got an opening that contains some of the gentlest, most tender vocals Geddy ever recorded, and every section is incredibly evocative and atmospheric, creating a feel that Rush would never capture again, even on "2112." It's even got a rare Peart drum solo, which lasts just long enough to be cool but doesn't overstay its welcome. Does it have the same stadium-pounding drive of "2112?" No. It's subtler, calmer, and it "rocks" far less, but I'll still take it over "2112" with a gun to my head. The most impressive thing about these latter tracks, though, is that it never feels as if Rush's reach exceeded its grasp. Are there brief moments of inconsistency? Sure. Are there unfortunate spoken word passages? Yes. But these songs have a charm to them that is totally missing from the perfectly polished later releases from this excellent band, and I think there's something to be said for that. In closing, then, Caress of Steel is far from a perfect album. It lacks the power and punch of 2112, and it lacks the through-and-through compositional prowess of "Farewell to Kings" or "Moving Pictures." That said, however, it's still one of my favorite Rush albums. Is it a masterpiece? No. But I will argue to the ends of the earth that it has a place among every progressive rock collection, and especially among the collections of anyone who calls him- or-herself a Rush fan.